ESJ has hosted Book Clubs for many social justice-oriented educational books. Currently we do not have any Book Clubs scheduled, however, if you would like to suggest or organize a Book Club, please contact us! 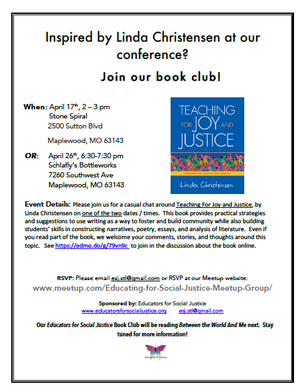 Please join us for a casual chat around Teaching For Joy and Justice, by Linda Christensen. This book provides practical strategies and suggestions to use writing as a way to foster and build community while also building students’ skills in constructing narratives, poetry, essays, and analysis of literature. Even if you read just part of the book, we welcome your comments, stories, and thoughts around this topic. See https://edmo.do/g/79vn9c to join in the discussion about the book online. 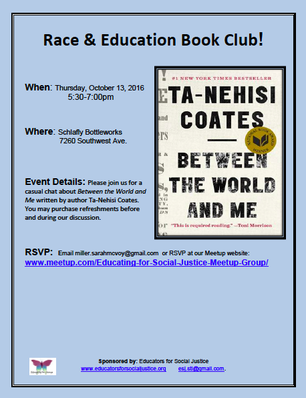 Our October book club will focus on the book Between the World and Me by: Ta-Nehisi Coates. Join us on Thursday, October 13, at 5:30pm at Schlafly Bottleworks in Maplewood for this first book club of the 2016-2017 school year. This year we'll be offering a social justice book club bimonthly to discuss some great books related to social justice and education. 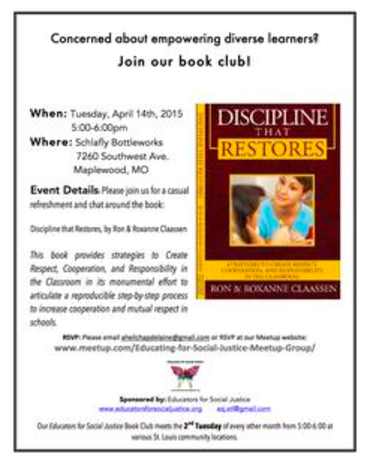 Join us for a Book Club Meet-up on April 14 at 5:00 at Schlafly Bottleworks. This book is based on Restorative Justice principles and provides strategies to create respect, cooperation, and responsibility in the classroom in its monumental effort to articulate a reproducible step-by-step process to increase cooperation and mutual respect in schools. ​Deborah Meier has spent more than 40 years working in public education as a teacher, principal, writer, and advocate and ranks among the most acclaimed leaders of the public school reform movement. Some of Meier’s books include: The Power of Their Ideas, In Schools we Trust: Creating Communities of Learning in an Era of Tests and Standardization, and Playing for Keeps: Life and Learning on a Public School Playground. ​Choose one of her books and come & share your thoughts with us. We will discuss themes, ideas & what we can do to make a difference!